It is not uncommon to see buggies in the NE Indiana community with stickers on their SMV triangles. I have seen Jayco stickers, KZ RV stickers, logos of fish, deer, horses, and a few religious bumper stickers. And it’s not just the youth either. I have seen several married people with stickers on their buggies. The youth are more likely to have stickers that push the boundaries. For example, I once saw a bumper sticker about dancing drunk on the back of a Rumspringa buggy. This is true in other communities, particularly the larger settlements. I have also seen stickers on buggies of other plain churches. Last week in Lancaster County I noticed a Native American decal on the triangle of an Old Order Mennonite buggy, complemented by additional Native-style decor hanging inside the buggy itself (a dreamcatcher, popular with Amish youth too). That is a Ford emblem you see on this Lancaster Amish buggy below. I took this photo six years ago. I sometimes wonder if the owner ever “graduated” to the real thing or if this insignia was as far as dreams of more horsepower took him. The orange SMV marker is the most contentious object on Amish transport and perhaps in all of Amish society. On the one hand there are those who are so deeply against using the triangle that they would rather go to jail than adorn their buggies with the worldly symbol. On the other, some Amish, particularly youth during the transitional period before marriage, happily dress aforesaid symbols up with an extra dab of the world (not that Amish parents are universally happy about it). Speaking of which, while driving some Lancaster Amish boys this past weekend, the Swartzentruber Amish happened to come up in conversation. For these boys, the Swartzentrubers were an exotic tribe, distant Ohio kin probably viewed as peculiar by them as some English see the Amish as a whole. No doubt the Swartzentrubers frown at the enhancements these young men and their friends place upon a symbol they already find objectionable enough. Maybe this is as odd to them as not having a triangle at all seems to many English and more than a few Amish. 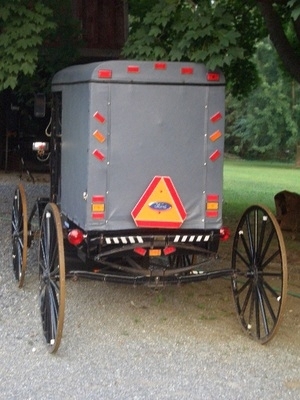 Have you noticed decals or other adornments on Amish buggies? Ever on places besides the SMV triangle? 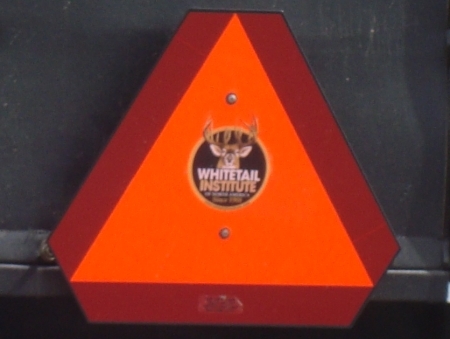 A NASCAR racing logo, National Rifle Association decals, and other hunting-related decals are common. I spotted one with a Great Adventures Amusement Park bumper sticker. An article in the Lancaster Sunday News on carriage decorations reported that boys’ carriages sported a variety of decals and bumper sticker messages, including “Single and Ready to Mingle” and “Get High on Milk: Our Cows are on Grass. There are people in the English world who absolutely do not put stickers and decals on their cars unless it’s licensing stickers or something. My father’s cars, for instance, never had additional stickers on them except ones that denoted “exp. ‘89” on the front windscreen or on the license itself, or factory added stickers, like I can remember being thrilled that as a kid my car door window had a official brand of the Calgary 1988 Olympics decal on it. As far as the dream catcher thing, that is curious to me, do you think that the Amish feel a certain level of kinship to Native peoples because of being a minority and maybe sometimes misunderstood or hard done by in their travels through history and the world? I think the mischievous Amish humor surprises a lot of people! Is it legal to place another decal inside the borders of a SMV sign? Good question Carol. 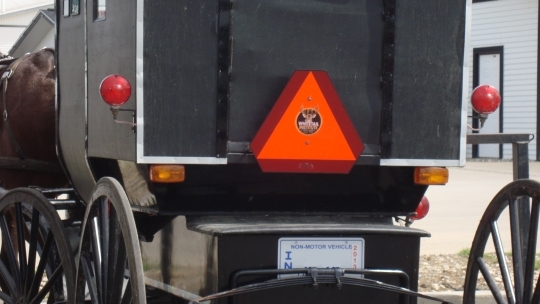 The Horse and Buggy Driver’s Manual warns buggy operators not to put stickers on the emblem because it “decreases the amount of orange required by law.” I haven’t ever heard of anyone being stopped or required to remove the decals though. I can not even repeat what I saw on an Amish buggy a few months back.I actually thought one of his friends were joking with him (although coursly) and pulled over to tell him what he had on his buggy. I had my 17daughter year old daughter with me and he leaned over me and asked if my daughter had a phone!!! Luckily I was on my way to the bishop’s house in the district 🙂 his dad had that sticker off before I left my friend’s house. I haven’t been around the Amish enough to notice these things. However, I had the same question as Carol about the legality of placing decals on safety triangles. And SHOM, my husband is of the same ilk as your Dad…he even goes so far as to remove the dealer’s decal (“it’s free advertising for them…why should I do that?” is what he says) from the vehicle, including removing license plate holders that also include the dealer’s name. Jeeze! I am very curious about your husband’s name. Forgive my ignorance if this is a common Amish name but where does SHOM come from or what is it short for? Greg: I think Alice Mary was addressing that post TO “SHOM”. I don’t think that she was saying SHOM is her husband’s name. BTW: I think SHOM stands for Slightly-handled-Order-man, as in the author of the second post in this thread. Seeing this topic on buggy decals reminds me of a bumper sticker one of Mark’s nephews got for him as a Christmas present. It stated “HONK IF YOU’RE AMISH!”. Mark had to tell him he could not and would not stick it on his buggy. I don’t think Colin ever did understand why Mark wouldn’t use it. Mark said to him, “It’s just not appropriate and just not done. It just isn’t.” I don’t know what Mark ever did with it but I don’t think I’ve ever seen any kind of decal or bumper sticker on any of the Belle Center buggies. Welcome back, Don Curtis. I too am glad to see you post again! Been missing your informative posts. Hope all has been well with you and yours. Maybe Mark could give YOU the bumper sticker? (He could always send it to me!) 😉 It wouldn’t make as much impact on my car as on a buggy, though! It’s a good thing the buggy with the Ford emblem triangle didn’t have a Toyota emblem, lest the horse exhibit some “unintended acceleration” and crash. Nor a Honda decal, either — I just received a recall notice from them in today’s mail. I just hope it’s a minor recall I was supposed to have fixed a year or so ago, but never did! I myself have never seen an Amish buggy in “real life” — not that I can remember, anyway, as I’d have been so young — but the Native American decal and dreamcatcher aspect is interesting. What I know from my own relatives and family is that when the Shawnee Indians were finally foreably evicted and relocated out of Ohio, during the first half of the 19th century, some families, bands, and even children remained ( illegally … so wrong and so sad ) behind in areas of western Ohio, mainly central areas near Hardin County, Piqua, etc. Now, my understanding is that while some children were forcibly detained by non-tribal officials ( to be “given better lives” sighs ), other children were secretly given up for adoption by their own parents. These Shawnee parents, making what had to be an unimaginably difficult decision, chose for their infants and toddlers to grow up in their own homeland, rather than being forced to move to artificial destinations chosen by the US governments. Some of the remaining Shawnee bands dissolved into more immediate family groups, and were not only taken in, but hidden, and de facto adopted, as well, primarily by two groups: the Amish and Methodists. So there were, then, entire families as well as children who were claimed by these groups ( and others who wanted to help, I’m sure ) so that they might remain here. Some Shawnee families made it on their own, disguising themselves best they could as white farm families, which worked fairly well. Today, there is finally a state-recognized band of Shawnee in Ohio once again, which is a wonderful thing for all the families and descendants of the Shawnee who refused to leave Ohio. But it can be a very hard thing to trace one’s family back, except via family word-of-mouth, as the Shawnee who remained in Ohio did so illegally, often leaving behind few names or clues as to their origins. It’s that way for my family. A good quarter of my family were among those adoptees, children who were adopted into Methodist groups, rather than into Amish ones. But, via those adoptions, our family lost original names that could have definitively linked them to the United Remnant Band of the Shawnee Nation. What remains for our family, now, are stories, precious few photographs, and some fabulous “nicknames” among our Shawnee family. Someday, I might try to link our family with the official Band genealogy, but it will be tough, if not impossible. But I do wonder, and have wondered on the rare occasion in the past: how many individuals or families among the Amish know of similar things about their own families? I wonder if some of the “secret” Native adoptees are still remembered by Amish families, and wonder if, at least in part, that accounts for some of the Amish interest in Native decals or dreamcatchers ( not that those things aren’t immensely popular in the general public! ), or for the photos of Amish individuals I see every once in a while, individuals who seem to just not quite “look Amish,” those with darker-colors of skin, eyes, and black hair ( *laughs* even IF many Shawnee even in the 1800’s were much lighter in looks than many Natives ). Oh I wrote so much I hope it makes sense….I think I was outside too long, and even in the nice weather, the heat got to me a bit lol. One family history has a story of a Native American baby girl, back in about 1870 in northern Indiana, that was dropped off in a basket at an Amish home, with a note “Take good care”, and the baby’s birth date. The baby was then given to a childless Amish couple. She grew up and married a Yoder, and was Amish when she died. In her last years, her family found out she came from a family with the surname Lytle, but it’s possible the surname was adopted from a white family. I think there are DNA tests that would help to determine the genealogy or ancestry. Your writing does make me question if perhaps the baby girl was from Ohio. I heard there are some Bylers with Native American ancestry. Amish with Native American ancestry? Occasionally I see Amish with rather dark complexions and features suggestive of a non-Germanic or non-Caucasian background. I have heard it told before of the possibility of Amish with Native American ancestry. I have never heard or seen evidence of it however, and have wondered if this was just an explanation for physical features that seemed to make sense while the truth might lie elsewhere. It seems with the genealogical records kept by Amish that this would be checkable. Of course there is also the possibility of illicit children which I assume would not be reflected in the records. Sadie, thank you for such an interesting story. I had never heard about Shawnee adoptees + the Amish + Methodists. Anyone else have anything to add? I would think that with modern science + genetics, there should be some way to verify bloodlines to some extent. This reply might be vague, Mary Alice, but there is a test you can take to determine your genetic make up and it’s origin in the world, I think. My cousin did something like this, and apparently you send this company a saliva sample and from that they can do test and determine your origin. I’d be interested in learning my cousin’s results as at least half of his genetics are the same as mine; related to his father and his father’s sister – my mother and their family dynamic. I don’t know what company or organization you’d use to do that, but I’m sure if you ask around, maybe at your doctor, or at a hospital, they’d point you in the right direction, if you wanted to do such a thing. I have seen a silver metal Christian fish symbol emblem on the SMV triangle. My neighbor went to Jail for refusing the triangle. He and the community here would not concede. They went to Frankfort and several other places fighting the law passed. They would put tape on, or lanterns but would not use the triangle. We live a very small town and it was horrid how the city had nothing better to do than bug the Amish. 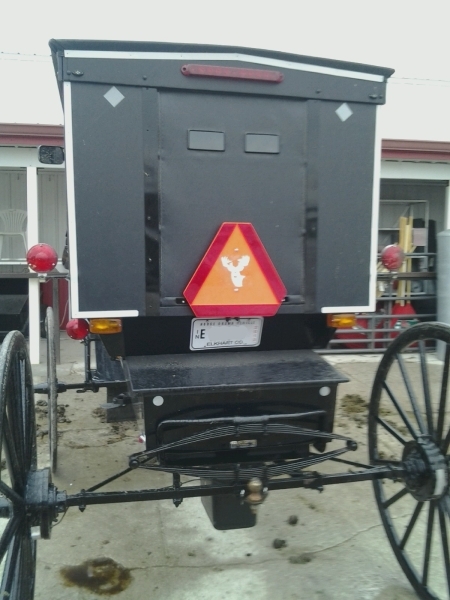 We have Amish friends who have a sticker on the triangle on their buggy in memory of a family member who passed away.